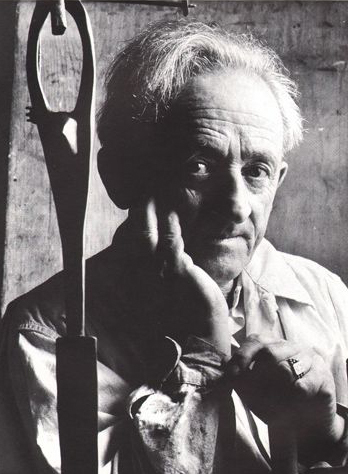 Although the name of Lippy Lipshitz is synonymous with South African sculpture, it is little-known that he produced a small body of paintings. As a sculptor, and like many other sculptors of note, he felt drawn to drawing and graphic media in preference to paint. He thus made many small works on paper in the form of monotype prints, woodcuts and pastel drawings. Room to let is a work of 1961, produced when he was teaching at the Michaelis School of Fine Art at the University of Cape Town. Judging by the dress of the figures in it, it seems to be a scene in Cape Town’s ‘Malay Quarter’. What is noticeable in this drawing is Lipshitz’s sculptural sensibility at work in the two main female figures on the left. Their bodies appear to almost merge, creating a ‘closed form’ which contains the germ or idea for a possible sculpture. Looking at the artist’s sculptures, a fair number of which are made of paired figures, such as Jacob wrestling with the angel (Iziko SA National Gallery) makes this point clear. The unfinished ‘look’, as well as the quick and immediate handling of the pastel medium demonstrates Lipshitz’s concern with the essence of the underlying form and abstract idea. Born Plungian, Lithuania, 1903; died Kiryat Tivon, Israel, 1980. Training 1922–1925 under Percy Thatcher and Charles Groves at the Cape Town School of Art; 1925–26: Michaelis School of Fine Art under the sculptor Herbert Meyerowitz. 1928–1929: Academie de la Grand Chaumiere, Paris, under Antonin Bourdelle (1861–1929). Selected exhibitions 1932: Solo exhibition, Martin Melck House, Cape Town; 1944: Durban Art Gallery Retrospective Exhibition; 1948: South African Art, Tate Gallery, London. 1956: Quadrennial Exhibition; 1960: Quadrennial Exhibition; 1976: Retrospective Exhibition, Iziko SA National Gallery. Awards 1953: Cape Tercentenary Foundation Certificate of Merit; 1959: German Settlers Memorial Competition, East London; 1964: Medal of Honour for Sculpture, SA Akademie vir Wetenskap en Kuns; 1978: SA Association of Arts Medallion. Collections Durban Art Gallery; Iziko SA National Gallery; Nelson Mandela Metropolitan Art Museum, Port Elizabeth; Pretoria Art Museum; Tatham Art Gallery, Pietermaritzburg; University of Cape Town; University of Stellenbosch; University of the Witwatersrand; William Humphreys Art Gallery, Kimberley.